An old bandit out of retirement. Four antique "Texas Redback" bills stolen from a museum. The threat of a Wild West shootout. It was up to the Terrapin Sheriffs to fly a small aircraft to the bandit's hideout to drop off an arrest warrant and to retrieve the missing Redback bills. 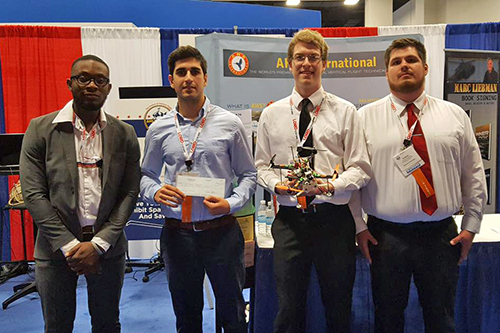 And on May 8, 2017, the University of Maryland undergraduate team did just that when they took first place in the American Helicopter Society (AHS) International's 5th Annual Micro Air Vehicle (MAV) Student Challenge. Themed "Package Delivery in the Wild West," the event challenged teams to create a MAV—a miniature drone operated autonomously or by remote control—capable of traversing an obstacle course and delivering an envelope weighing 25 grams, about 0.06 of a pound, to a designated drop-off location. The MAV then had to acquire another envelope and deliver it back to the starting position. The entire task needed to be completed in under 10 minutes using an attached camera to steer the vehicle. The Terrapin Sheriffs was one of three international teams selected to participate. The competition took place at Fort Worth Convention Center, Ft. Worth, TX, at the 73rd AHS International Annual Forum and Technology Display, where teams battled for first place and awards totalling up to $5,000. The Terrapin Sheriffs, consisting of four aerospace engineering students, competed against two other finalists: Concordia University from Montreal, Québec, and Vaughn College from New York. "It doesn't sound that complicated, [but] it gets really complicated once you get the vehicle flying. All kinds of things that you wouldn't even think of could go wrong," said team member David Hairumian. The complexity of flying the vehicle is reflected in the restrictions the team had to work under when making their design. Each electric-powered vehicle needed to be configured for vertical takeoffs and landings and be able to hover using rotors or propellers. There also had to be at least one onboard camera for beyond-line-of-sight operation. The biggest challenge was meeting all of these specifications without exceeding the 1.1 pound limit. Despite the restrictions and challenges, the Terrapin Sheriffs not only finished the course with the fastest time but were the only team to successfully complete it on their first attempt. It's a story of practice makes perfect. The team prepared for the competition for months—even practicing in their hotel room every night leading up to the event. Cutting-edge technology and design decisions also gave the team a more competitive edge. For example, they chose to receive the camera footage through First-Person-View goggles. "We ended up finding out the goggles are a more immersive experience. When you have the goggles on, it puts you in the position of actually flying this vehicle," said Nick Rehm, pilot for the Terrapin Sheriffs, when explaining why the team opted not to rely on LCD screens. "We initially started out with an LCD screen, but the goggles were significant in improving my ability to be able to feel what the vehicle was doing rather than just seeing." The vehicle frame was also made from a very lightweight but strong composite, which, combined with a custom control system, freed up much-needed weight for more creative designs elements, including the claws that scooped and held the envelopes. Developed by UMD team mentor and Assistant Research Scientist Vikram Hrishikeshavan in a state-of-the-art UMD lab, the control system is about the size of a quarter and weighs only 1.5 grams. The Micro Air Vehicle Laboratory, part of UMD's Alfred Gessow Rotorcraft Center and supported by alumni contributions, is a specialized lab that the team recognizes as one of their best resources. This year's event marks the second time a UMD team was the only one to successfully complete an AHS challenge. In 2014, the CDCL Dolphins won the 2nd annual MAV Student Challenge in Montreal, Canada. Graduate student Elena Shrestha was part of that winning team and has returned every year since as a mentor alongside Hrishikeshavan, Assistant Clinical Professor Derrick Yeo, and Distinguished University Professor Inderjit Chopra. "I have continued to stay involved because the competition provides students with a unique opportunity to gain hands-on experience developing drones and also interact with other teams from universities around the world," said Shrestha. "I especially enjoyed working with this year's team because the students were very motivated and diligent."